Sometimes it's gradual. Over days, weeks, months, the feeling of a thousand fluttering butterflies tickling your insides takes over ever more aggressively. Soon, those butterflies have been vaporized by crystallized passion, burning like the fire of a thousand suns. It took some time, but you are smitten and you know it. Other times, the knockout punch is delivered immediately. Your eyes meet and in that instant it's already game over. Hook, line, and sinker: love at first sight. But this time, it isn't necessarily another's eyes that you're looking into; you might more accurately call them windows to the soul. Even more accurate still, you might just call them windows. Because that's what they are: the windows allowing you a glimpse inside Ann Arbor's hippest independent bookstore, Literati. Okay, so it's not so much the windows as what's behind them, and that would be a bookstore that any book lover would be proud to call their own. Situated on the corner of East Washington Street and South 4th Avenue, smack dab in downtown Ann Arbor, or A2, as we insiders like to call it (I really hope you rolled your eyes just now), Literati opened on March 31, 2013, and its owners, Hilary and Michael Gustafson, are firm believers in the "whimsy that an independent bookstore provides." That is to say, the Gustafsons believe in the experience of visiting a real bookstore where real people sell the books and book lovers of all kinds can meet and interact with one another face to face. And that's exactly what they've created with Literati, which is littered with staff-authored sticky note recommendations; books new and old, including those by local literary figures such as Raymond McDaniel, a professor with the University of Michigan's Sweetland Center for Writing, whose poetry collection The Cataracts was published in January; and, often, with those individuals I keep mentioning: book lovers such as yourself. 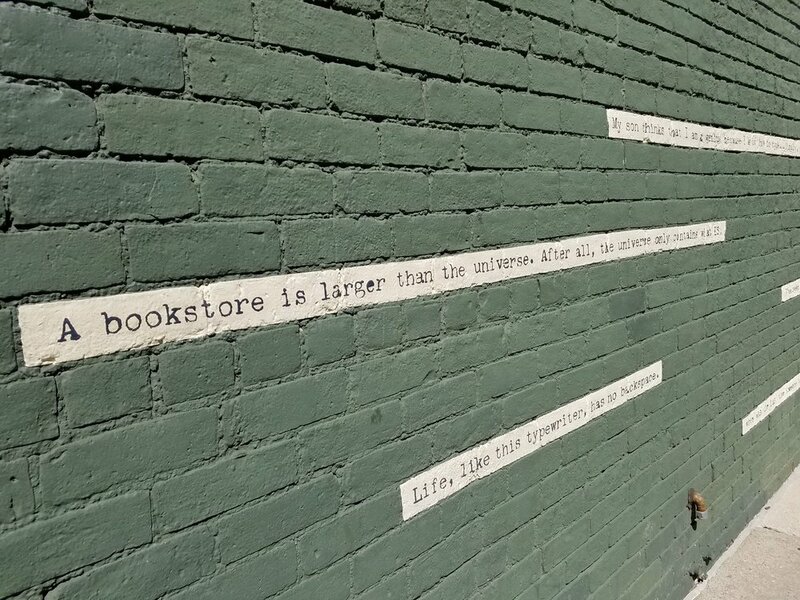 At street level, the bookshelves — purchased from the original Borders store, mind you — are primarily populated with poetry and fiction (the best forms of writing, if you ask me). In the basement, you'll find the non-fiction section and a public typewriter that has been a fixture in the bookstore since it opened five years ago. Of the thousands of notes left by patrons over those five years, Michael Gustafson, along with co-editor and designer Oliver Uberti, compiled their favorites and recently published them in a book called Notes From a Public Typewriter, which was featured in a Michigan Radio segment in early April. On Literati's site, the book is referred to as "our ode to this community of book lovers who have supported Literati Bookstore, and the written word" and I'm a little ashamed I didn't grab a copy for myself when I visited the store just the other day. Upstairs, you'll find Literati's quaint coffee shop, which is typically filled with college-aged peoples armed with laptops, headphones, and their favorite caffeinated beverages. There's enough seating for perhaps 25-30 people (though don't quote me on that), but even if the place is filled up, you can still grab your beverage to-go and take a moment to peruse the children's book nook. Literati has always striven to be downtown Ann Arbor's general bookstore, and as such there is no shortage of author visits, book clubs, poetry nights, University of Michigan-sponsored literary events and any other creative endeavors the Gustafsons and their staff can come up with. Community and the written word are truly what they're all about — and their efforts have not gone unnoticed. Since opening in 2013, Literati has collected a number of mentions in popular media, including appearing in The Huffington Post's "50 of the Best Indie Bookstores in America," in BookRiot.com's "The Best Bookstores in All 50 States + DC," in USA Today's "10 Things You Need To See in Ann Arbor," and in an article entitled "Resurrecting the bookstore: Literati and the renaissance of independent bookselling" from The Michigan Daily, the University of Michigan's student-run newspaper. And, of course, the bookstore has now also been featured right here on Logan's Run, which might be the most impressive accomplishment of all really (kidding!). But in all seriousness, if you find yourself in Ann Arbor anytime soon, be sure to stop in. You will not be disappointed.